I love food that tastes great and at the same time does wonders for your body. Portabello mushrooms are one such superfood, they have fiber phytonutrients, fiber, and unlike other foods antioxidants are not destroyed by cooking. Therefore grilling them is an excellent idea, because Grilled Portobellas are heavenly. Pair them with other colorful veggies – grilled or raw in this salad, and you’ve got something to be happy about. Or just eat it as a burger or steak, after all Portobellas are the other dark meat. 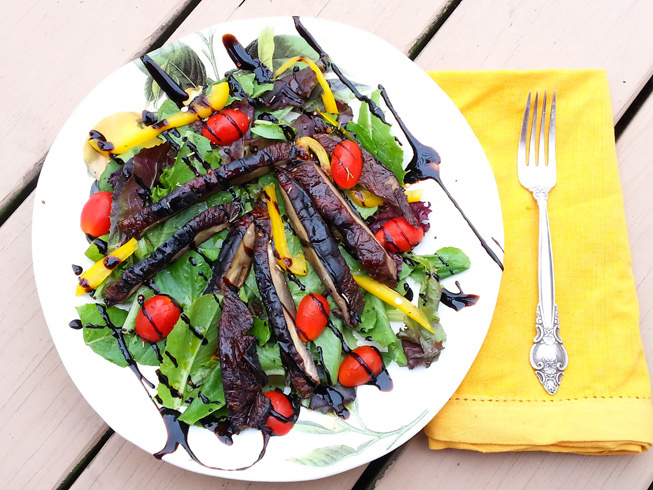 I marinate the Portobello caps with a balsamic, honey, garlic and herb based marinade, then Grill it or roast it for this incredible colorful and tasty salad. The left over marinade can be used as a dressing. Brush the inside and outside of mushrooms with the marinade and grill on both sides until soft, brushing with the marinade. Slice the grilled mushroom caps and add to tossed salad, dress the salad with the left over marinade and balsamic reduction, to add tang. I absolutely love how you put it together. Again! Super great! My favorite! you are such an inspiration!